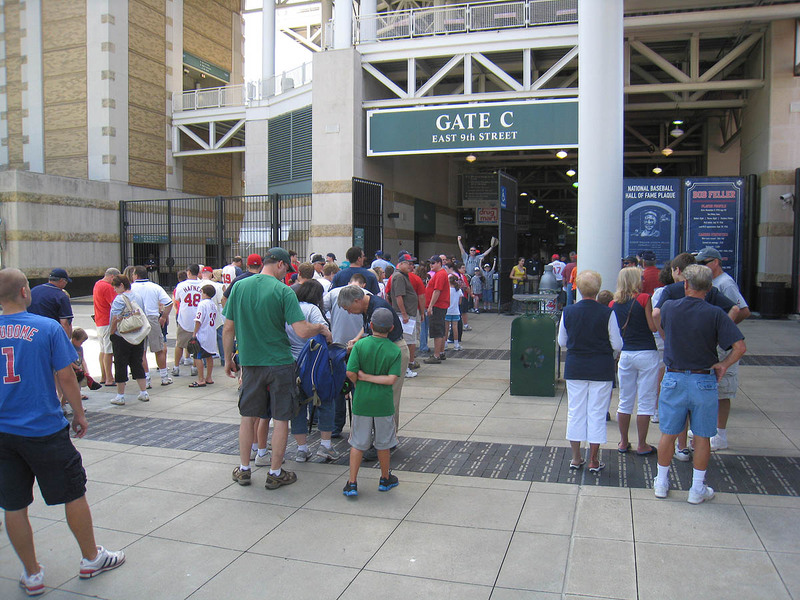 Indians: day/night doubleheader at Progressive Field beginning at 1:05pm. 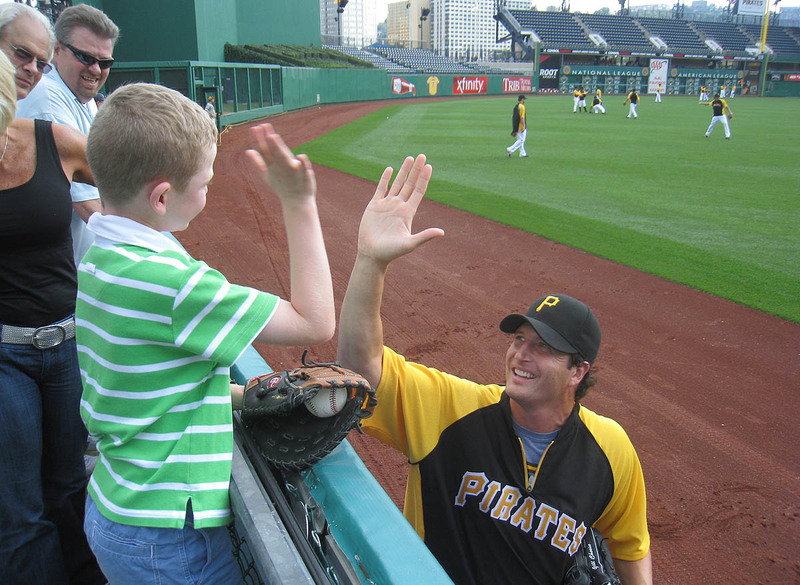 Pirates: night game at PNC Park beginning at 7:05pm. 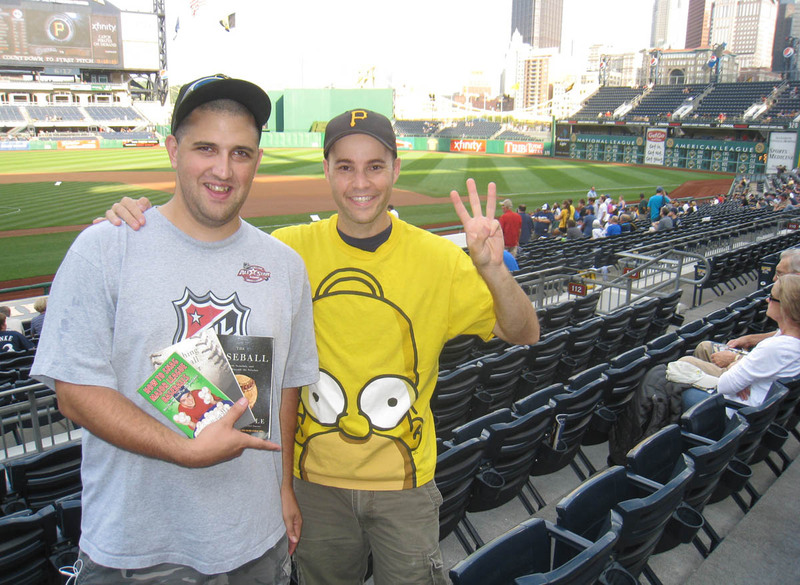 Distance from Cleveland to Pittsburgh: 133 miles. As I mentioned in my last entry, I had Watch With Zack clients from Seattle. Remember? 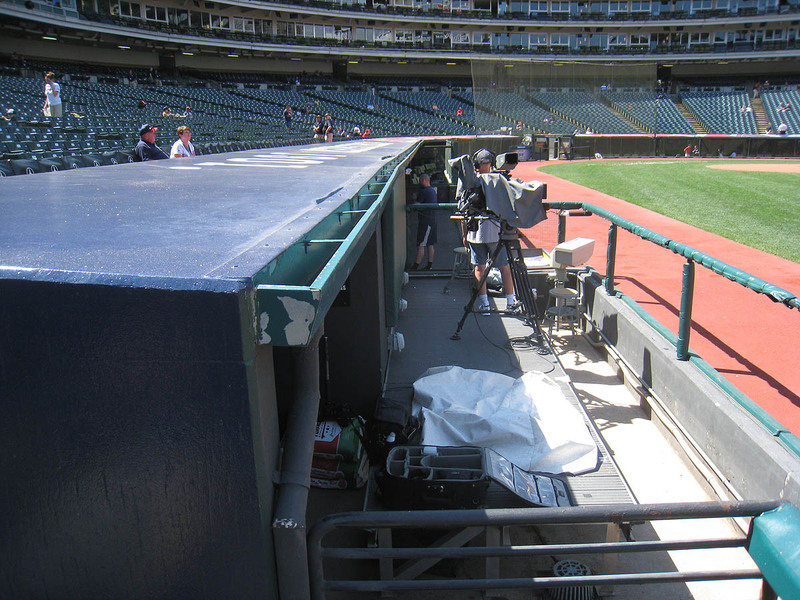 Well, this two-stadium extravaganza was Day 2 of our adventure, and I have to admit that I was nervous. You see, things get screwy when there are doubleheaders. 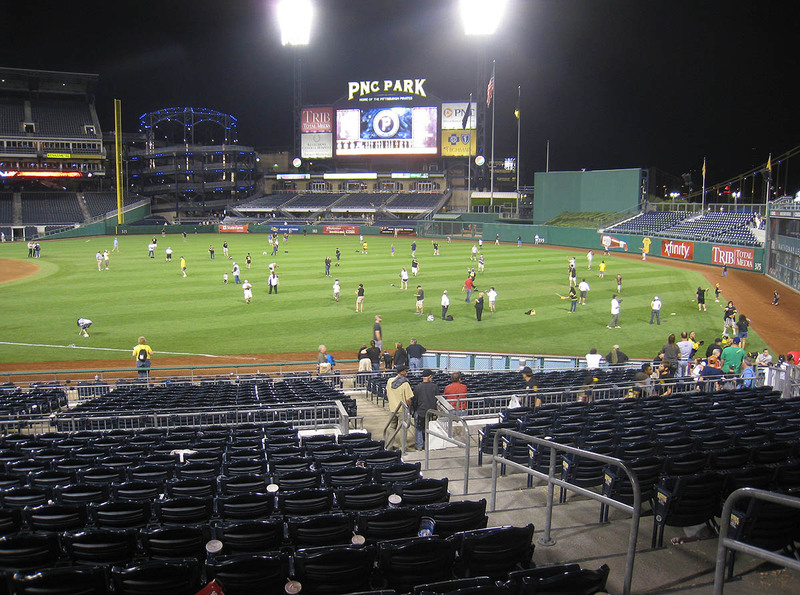 Teams rarely take batting practice, and stadiums often open later than usual. 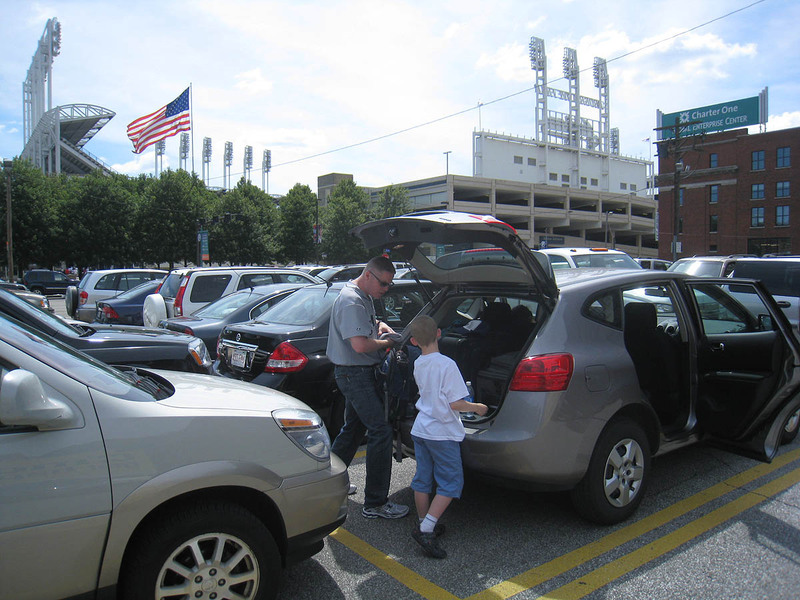 Progressive Field normally opens two and a half hours early, but in this case, it wasn’t going to open until 12pm — and as if that wasn’t bad enough, we were gonna have to leave at 1pm in order to make it to PNC Park in time for BP. 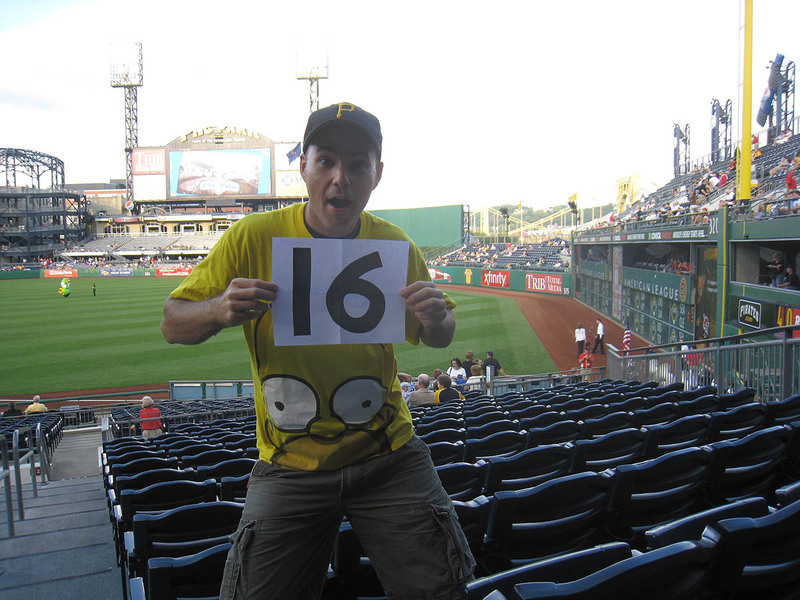 With ONE hour to work with inside the stadium and NO batting practice taking place, my consecutive games streak was officially on the line. In the photo above, do you see the guy at the front of the line with his arms in the air? That’s David, the father of the family that I was with. 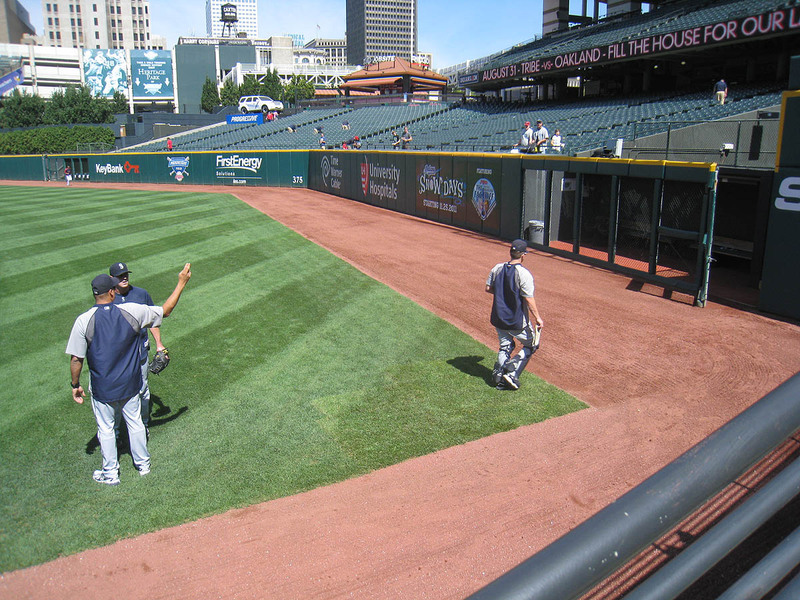 Look closely and you’ll see his kids (wearing gray Mariners jerseys) standing just in front of him. I neglected to mention in my last entry that David has three kids. Maple (age 8) and Maxine (age 7) came with him on this trip. His youngest child, a four-year-old boy named Hawthorne, stayed home in Seattle with his wife Michelle. And by the way, this was Maxine’s birthday. When the four of us were waiting outside the gate, David told me that I didn’t have to count this game in my stats. 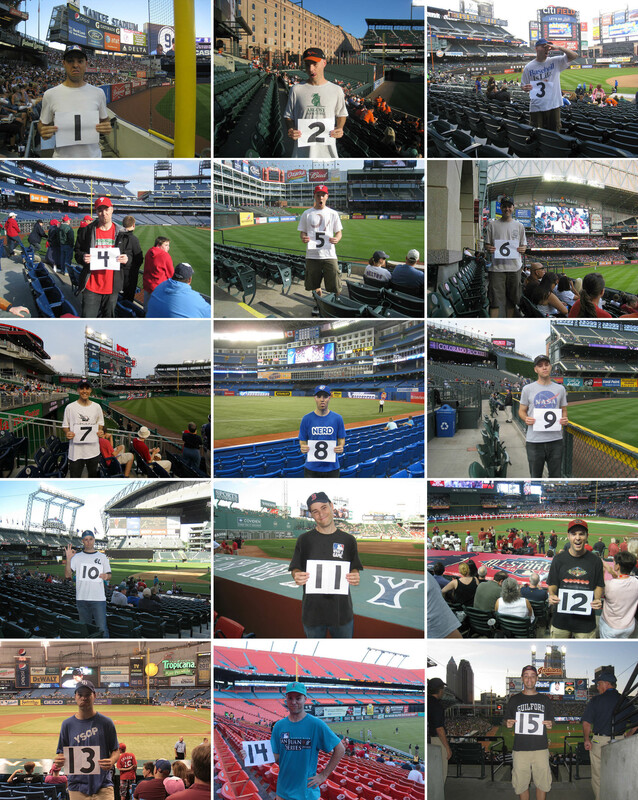 He said something along the lines of, “No one has to know that you were here,” but I insisted that if I set foot inside the stadium, it *had* to count. The only exceptions would be if I (a) attended a game that got rained out or (b) entered a stadium on a day when there was no game. 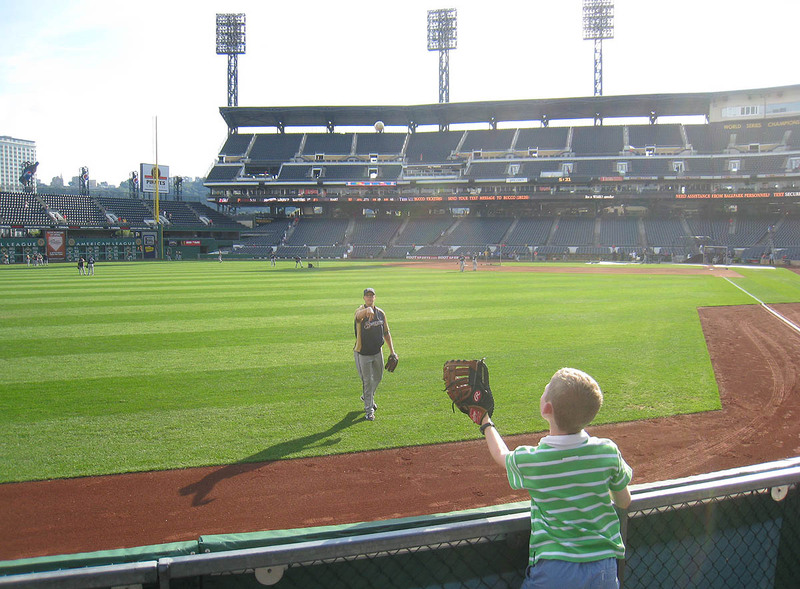 Catching that ball was SUCH a huge relief — and not just for me. David and his kids all understood the implications, so they were all rooting for me. The other day on Twitter, I asked for some help identifying this guy. 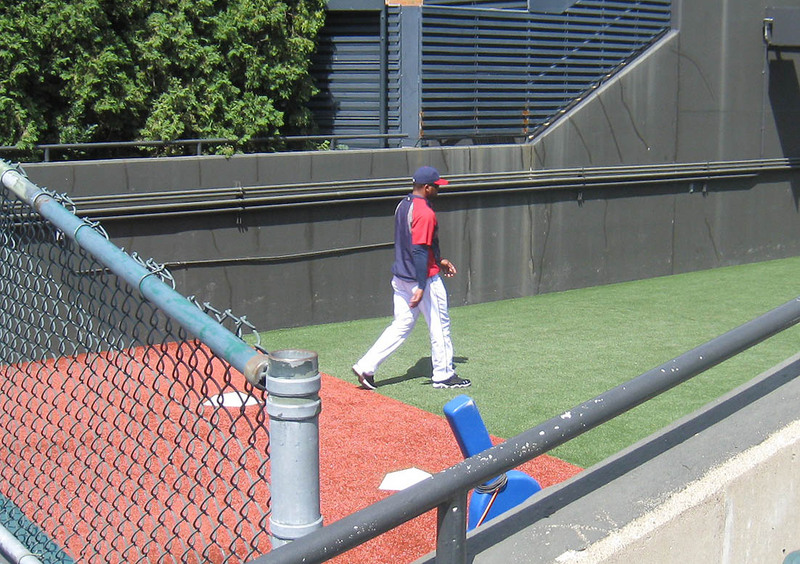 While some people guessed that it was Tony Sipp or Fausto Carmona, my friend Oliver insisted that it was Julio Rangel, the team’s “mental skills coach.” Can anyone confirm this or prove otherwise? It would be great to know. Sorry I don’t have a better photo. 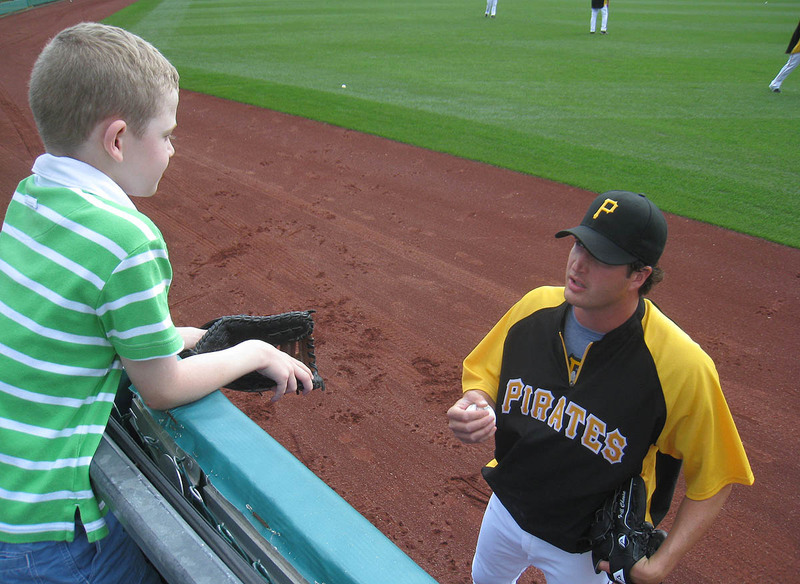 As Maple and I were racing back toward the seats along the right field foul line, we saw Adam Kennedy toss a ball to Maxine near the dugout. 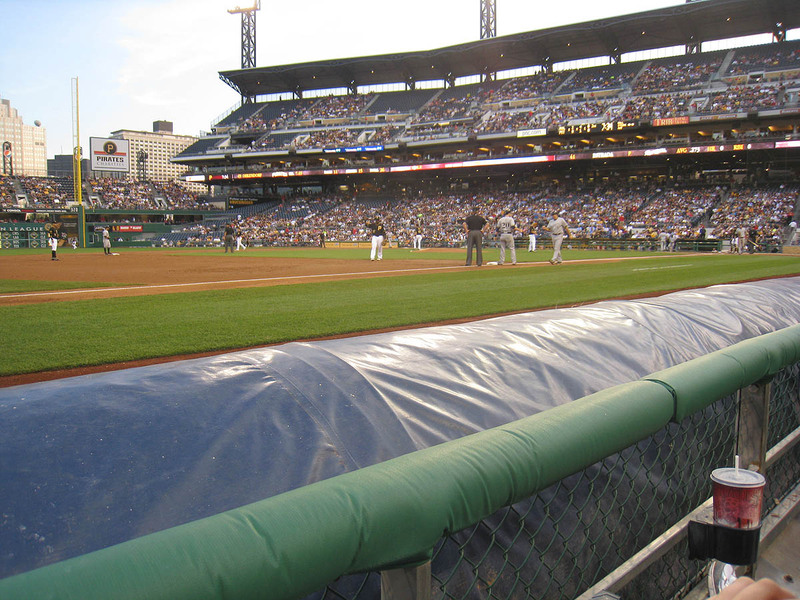 The ball barely eluded her glove and ended up in the third row. It was then picked up by a teenage boy who kindly handed it to her. The man’s name is Mark Morris. His son’s name is Zach. “Z-Mo” is short for Zach Morris. 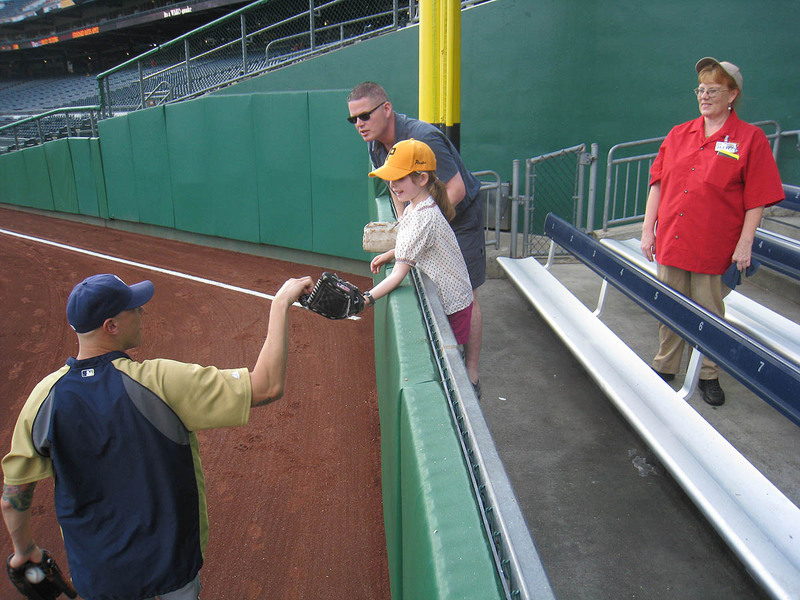 By the time I finished signing the ball, several other Mariners were just starting to play catch, so I headed down to the front row with Maple. Five minutes later, rookie outfielder Trayvon Robinson threw a ball our way. I caught that one and gave it to Maple, and then two minutes later, my young companion caught one that was tossed by Casper Wells. In the photo above, the ball on the left appears to be dirtier (extra-rubbed with mud?) on one side. See it? Pretty strange. I offered to give both of these balls to David for his kids, but he told me there was no need. …and hit the road. David drove. 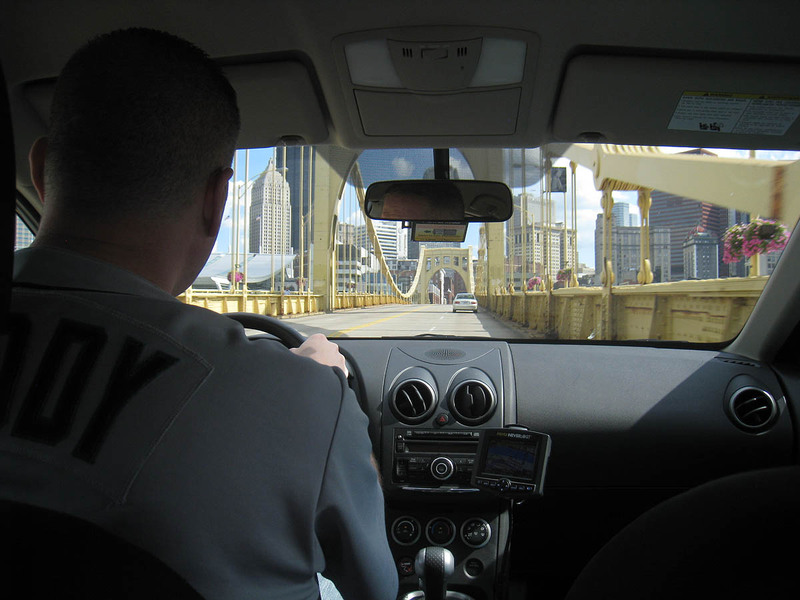 I sat in the back seat with the kids and helped him navigate and showed them the photos that I’d taken the day before. It was a stressful ride because David and I are both directionally-challenged and kept assuming that we were lost. Somehow, though, it all worked out, and we all found lots of stuff to laugh about. Thank you, Governor Corbett. We felt very welcomed. 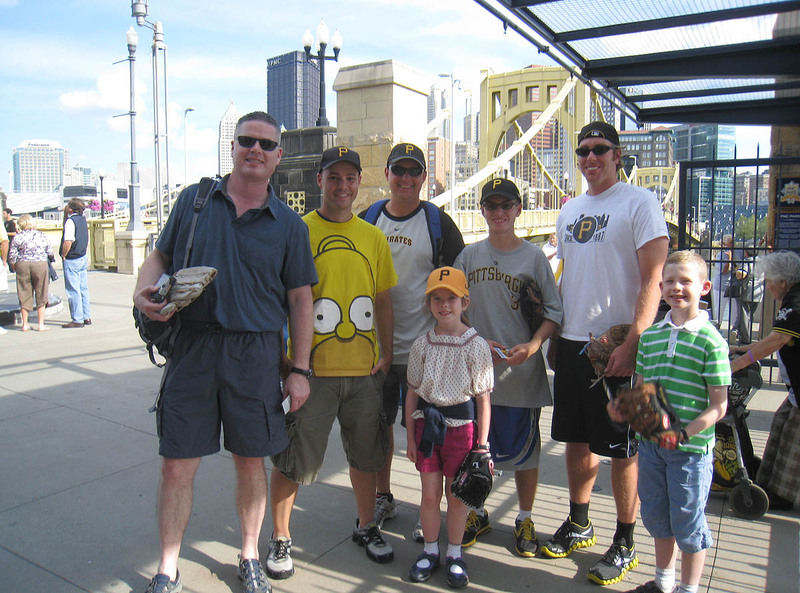 The bad news is that I got completely shut out during the Pirates’ portion of BP. The good news is that David and the kids didn’t. 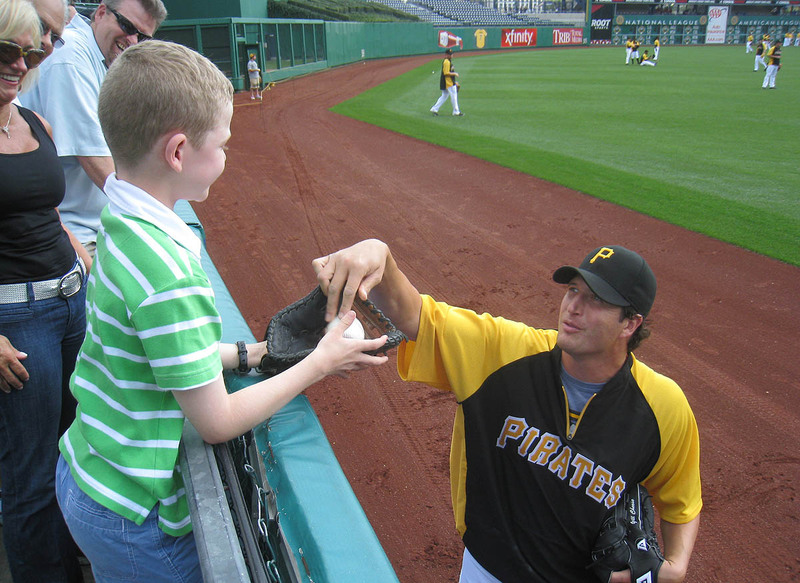 As for Maxine, she received a toss-up from a Pirates player, and then David snagged a home run for her that landed near them in the bleachers. When the Brewers took the field, I caught a home run on the fly that was hit by a player that I couldn’t identify. Erik was pretty sure that it was Jonathan Lucroy, so let’s go with that. Erik had already snagged about four balls by that point and finished the day with seven. I have to say, his performance was impressive. On several occasions, when I found myself out of position, he came swooping in from nowhere and maneuvered into the perfect spot. 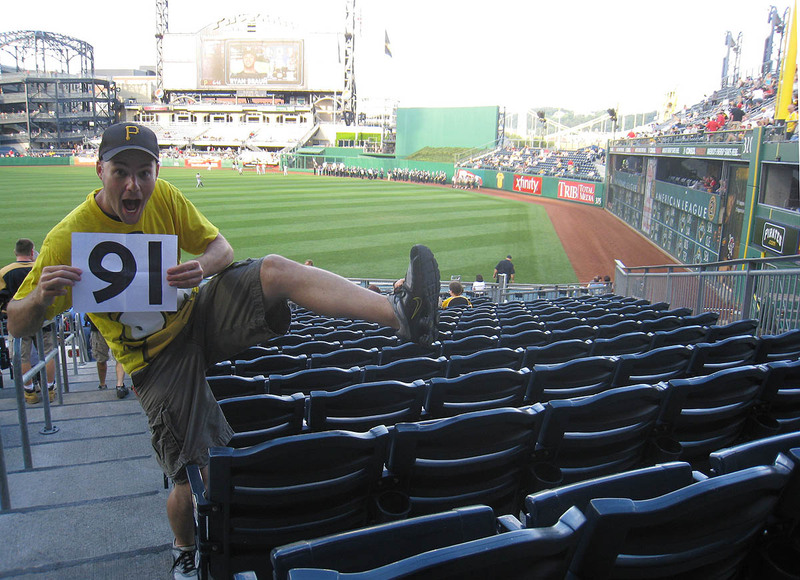 He has attended hundreds of games at PNC Park; this was only my 4th, and it showed. 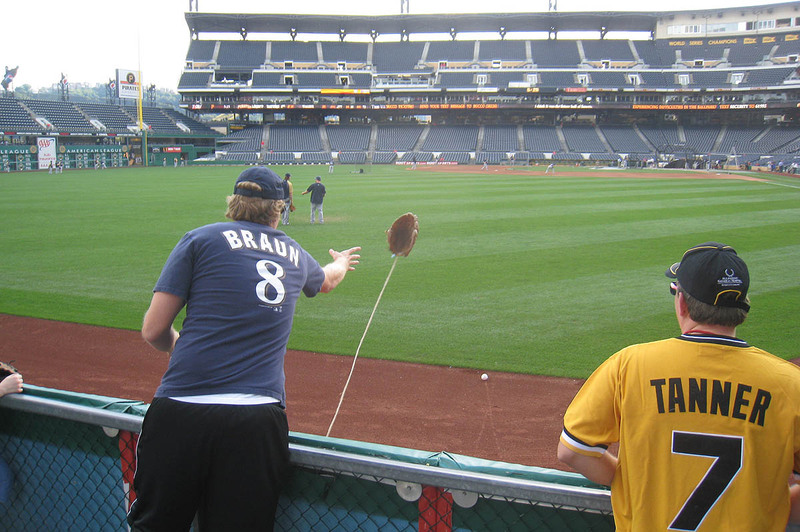 …and the third was thrown by Ryan Braun. These three balls raised her total for the day to five. After she got the ball from Loe, a middle-aged man decked out in Brewers gear complained about it. To say that I didn’t appreciate his comment was an understatement, and quite simply, I wasn’t going to let him get away with it. That was pretty much the end of it, although I got a few dirty looks after that — but hey, better me than Maxine. I can take it. She’s only seven years old and shouldn’t have to deal with such bitterness and negativity. I mean, if you want to complain that *I* catch too many baseballs, go ahead, but for the love of Rawlings, don’t get all pissy about a little girl out-snagging you. Some people don’t count balls that are given to them by other fans, and some people do. Maple and Maxine *do* count balls like this, so that’s all that matters. 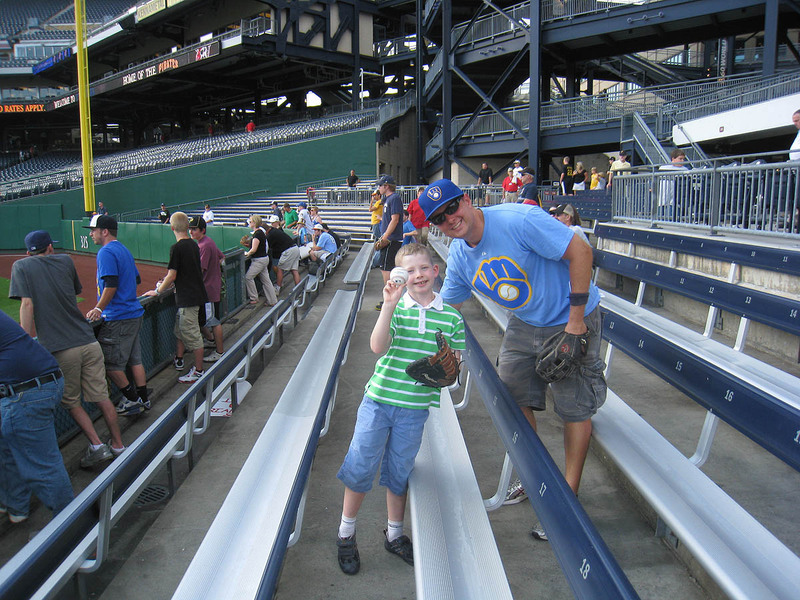 After BP, I took Maple to the 3rd base dugout and got two baseballs from the Brewers. 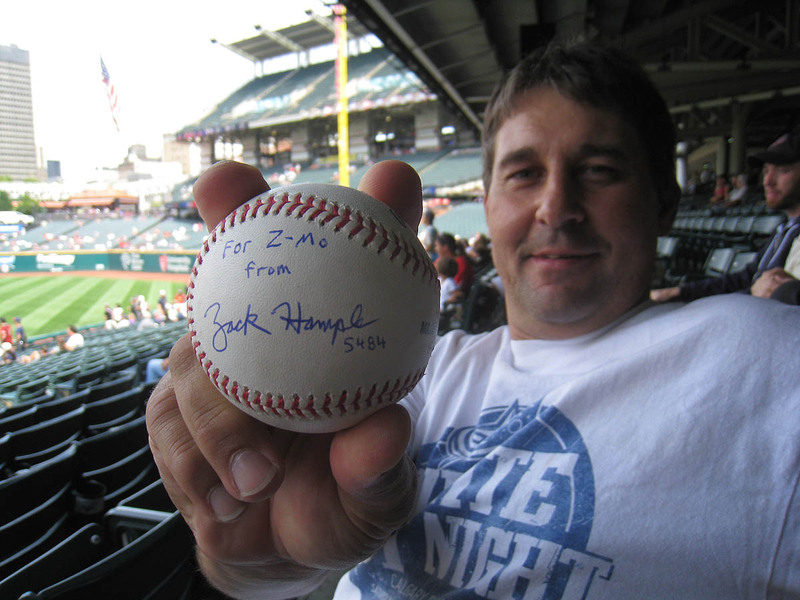 The first was tossed by Shaun Marcum, and the second came from bullpen catcher Marcus Hanel. Here’s a collage of the first 15. Harrison ended up walking over and placing the ball in her glove. That was actually *my* view. David and the kids were sitting one row behind me. Big difference. I was hoping for some foul grounders, but there wasn’t any action. 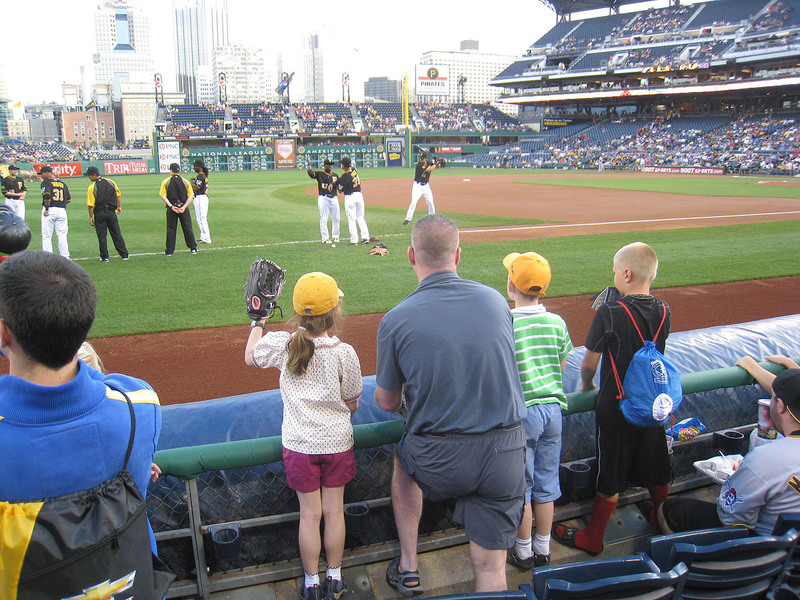 One of the many awesome things that Pirates season ticket holders get rewarded with is the chance to go out onto the field after a game and run around and play catch and do whatever. Can you imagine this happening at Yankee Stadium? HA!!! The Brewers, it should be noted, won the game, 11-4, and the highlight (as far as I was concerned) was Josh Harrison’s first major league home run. Unfortunately, I was halfway across the stadium at the time. Doesn’t matter. I wouldn’t have caught it anyway. It landed in the middle of a crowded row in the left field bleachers and was caught on the fly by a man wearing a glove. Here are two games’ worth of stats rolled into one. • 831 balls in 98 games this season = 8.48 balls per game. • 32 consecutive Watch With Zack games with at least two balls; click here to see a list of Watch With Zack stats and records. 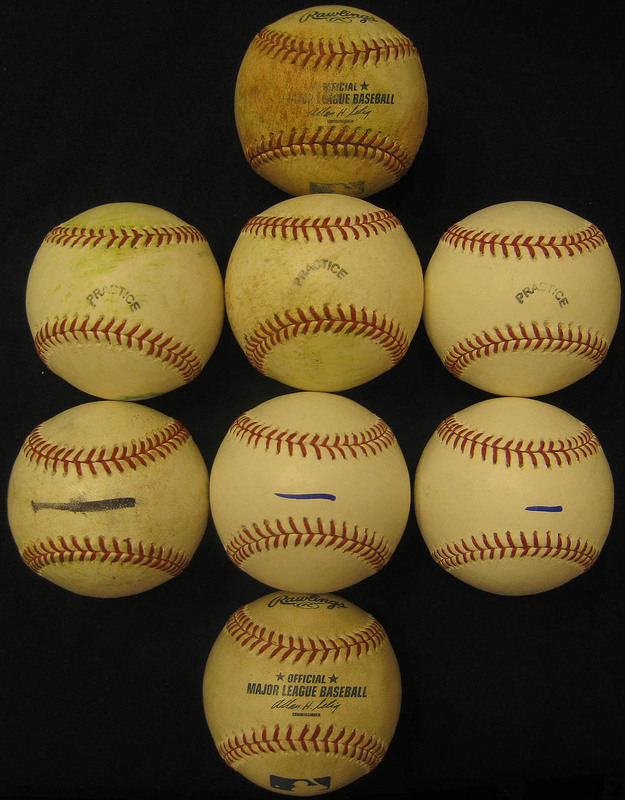 If you look closely at the ball on the left in the photo above, you can see that the seam is misshapen. The other two balls simply have interesting marks on them. 2 stadiums in a day. Impressive, how many times have you done that? Typo on the “David David” part above? Another awesome read, Zack. The two-stadium doubleheader is impressive enough, but snagging balls at both games is very cool. As always, thanks for sharing your adventures. 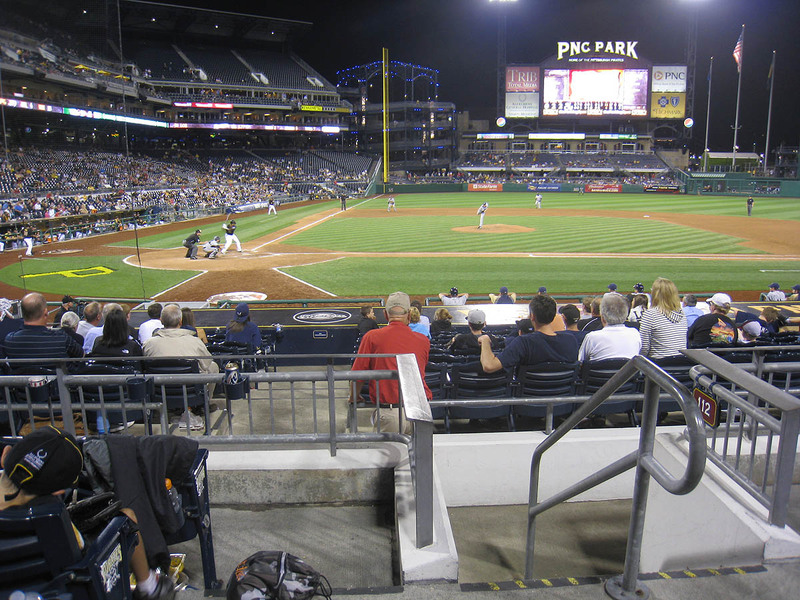 Did you hear about the Marlins game attended by 350 people? Is that a game you would have LIKED to have been at or not? 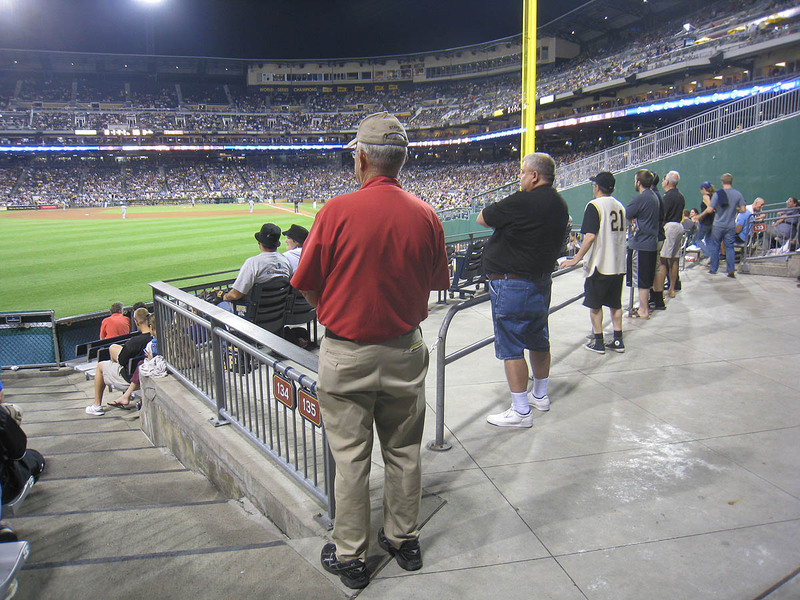 How many balls you think you could have snagged at this game… http://tinyurl.com/43wnyhj If a baseball game happens in South Florida, and no one is there to see it, does it still count…. for the unknown guy I know its definitely not a player because he gave me a ball when he was dragging out all the equipment. He’s wearing black Nikes with a white swoosh. This guy is not. Sure, Tony could change shoes…who knows. Also, Tony appears to wear a looser warm up jacket. Looks like you all had a great time. Also ,did you talk to Heath about getting the tickets that I won? 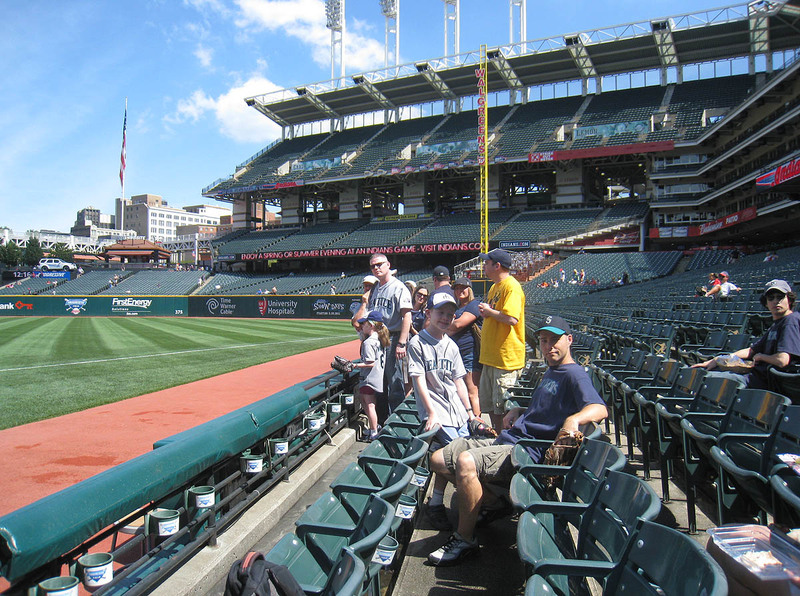 random, but do you think you will continue this sort of MLB stadium tour next year, or is this a one time thing? 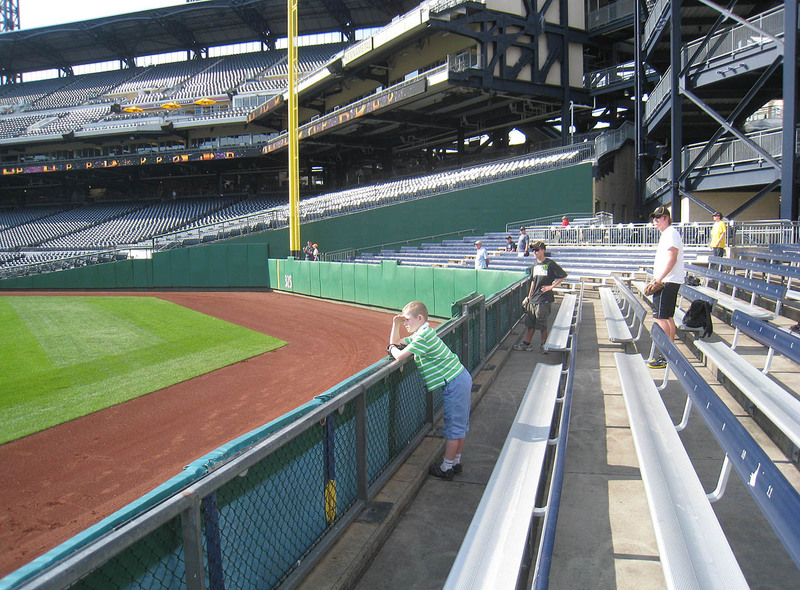 Nice chillin at PNC Zack. I sent you an email..
Ugh at the guy who yelled about the girl getting multiple balls. What the hell does he care. Disgusting. I think 91 stadiums is a new single-season record! Not sure. Maybe three or four other times, all in New York. Ohmygod, I would have *loved* to be there. Nothing good like that ever happens in New York, unless it’s the high school baseball championship game, but that doesn’t count in the ballhawking stats. Oof…a whole bunch of foul balls. Ha, nice trend here with players walking away. I’m stumped. Who? You mean Erik? Sorry to hear that, but in my experience, he’s always been great. No, I haven’t. As it turns out, I already got a free ticket offer for the one game that I’m gonna be there, so unfortunately I won’t need to talk to Heath about it. The only way that I’m going to do this much traveling again is if I get a sponsor, which seems unlikely. Woo-hoo! I’m a record holder! Hilarious. I’m not surprised. He does seem very nice. I feel so special to be one of those 347. Oh my gosh. I would have loved to be at the 347 fan game. I would’ve snagged my first foul ball ever and then some. You might’ve snagged 347 foul balls. 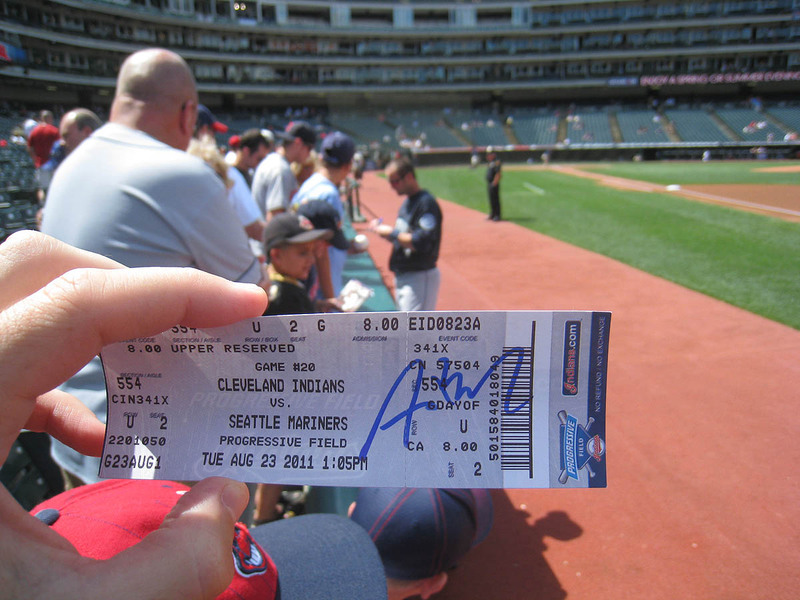 I was at that indians game standing right next to you!!!!! That’s amazing that we were so close to each other. I emailed you last night, so hopefully you got it. 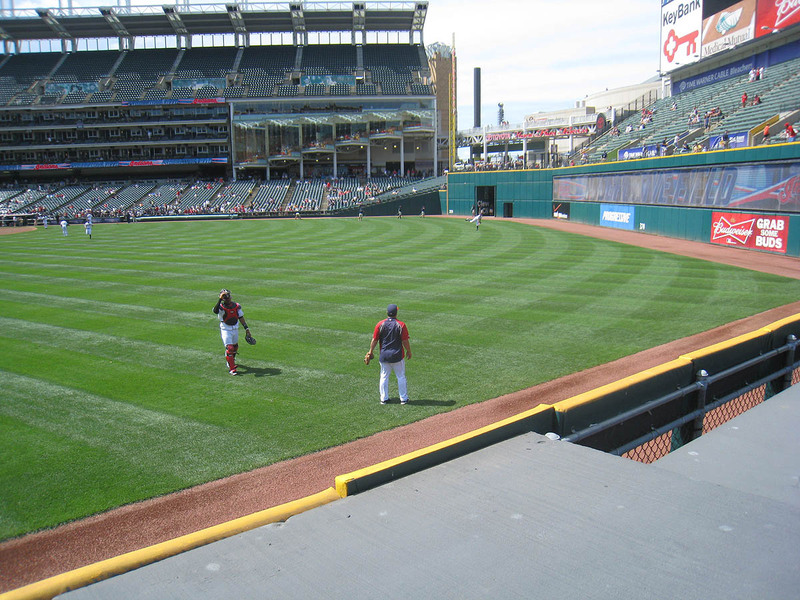 I was at the indians game all the way from WI. I got Adam Kennedys Autograph as well. Whoa, we were pretty close to each other. 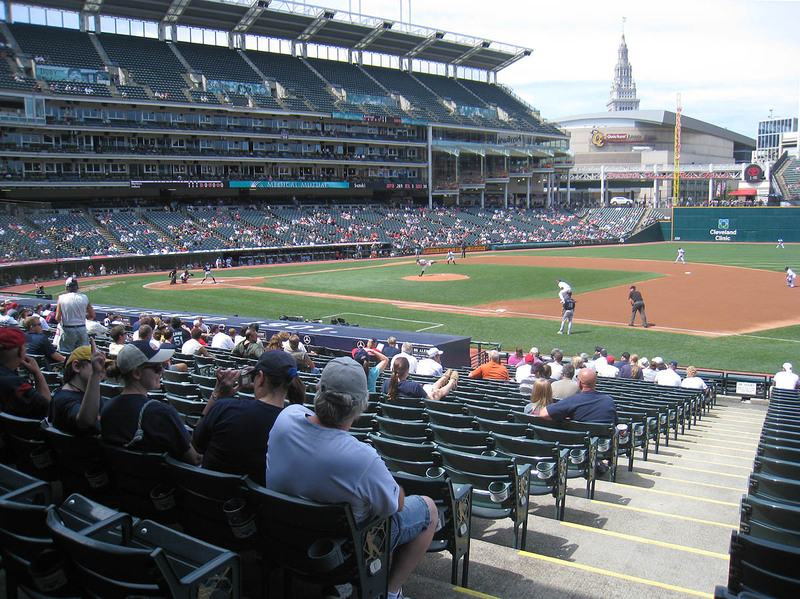 On that note, I should mention that I went on a road trip into the mid-west, and hit up games at Busch Stadium, Target Field, PNC Park, and Miller Park (also went to Citi Field (I live in NYC), Chase Field, and Rogers Centre, but they were part of different trips). 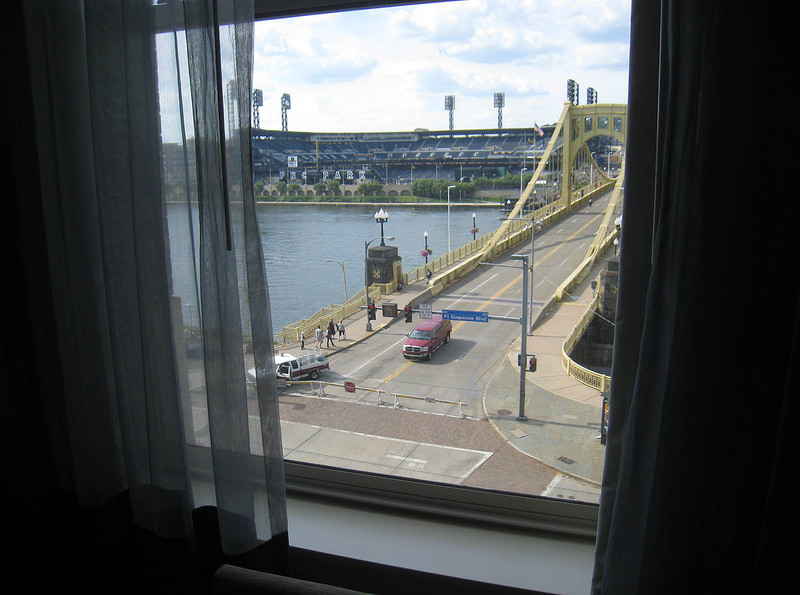 I blogged about Pittsburgh, St. Louis, and Minneapolis.